First designed in the late 19th Century, and extended in the 1920s, the garden is a magical combination of old fashioned roses, violas, hardy perennials, mature shrubs, trees, lawns and water. The Front of Mindrum House is flanked by lawns sweeping down to bluffs overlooking the Bowmont Water. To the south, the garden fragments into a range of smaller gardens and paths before cascading down into a wooded valley through a mature rock garden. For more pictures, please visit our garden gallery. 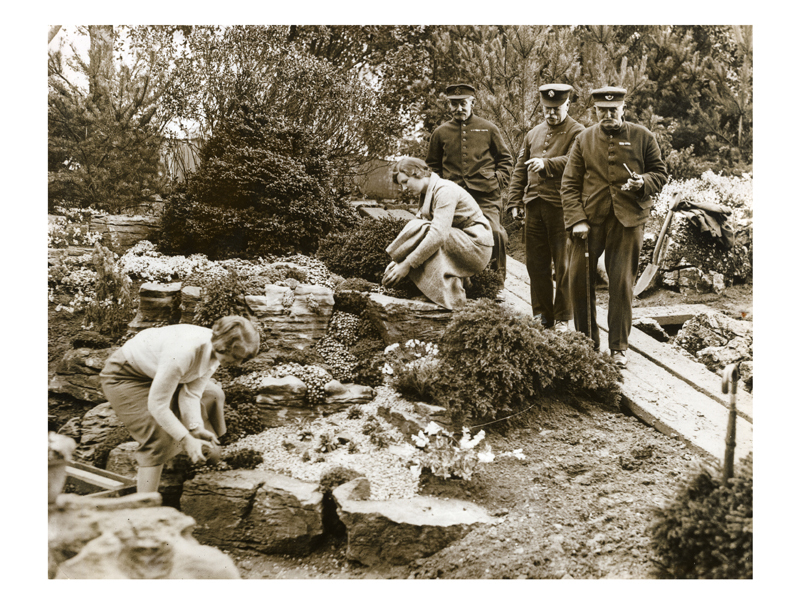 Could this be the same rock garden at chelsea in 1935? Much of the Garden was laid out in the 1920s and the limestone rock garden was bought as a display garden at the Chelsea Flower Show in the 1930s. In the early 1940s, the Rock Garden and much of the bottom of the garden were covered with soil and planted with Scots Pines as it became too much work. This lost garden was rediscovered and painstakingly dug out in the late 1950s. 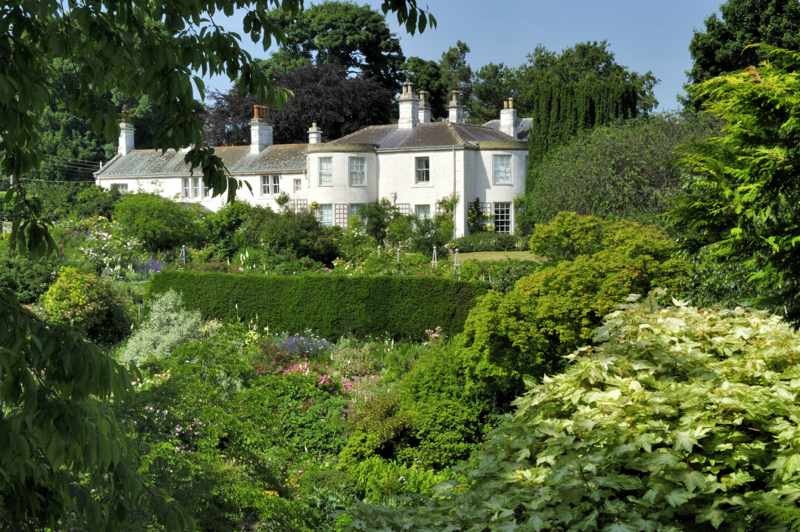 It now boasts a range of ponds, waterfalls and runnels, and at its peak, in summer, is a paradise of ferns, rambling roses and herbaceous borders bursting with fascinating life. A thoughtful combination, planted to bursting point, of woodland walks, gardens and rocky slopes, the garden combines tranquil secluded corners with wide open vistas as you stroll from one area to another. A woodland path through mature scots pines follows the burn upstream and round the far side of the valley. Winding through ferns and foxgloves it gives good views back along the river and onto the top garden. Should you take the other direction, you cross the mill race onto the Island where your path takes you along the side of the Bowmont water, over a number of small bridges. In season the island is a mass of wild rocket with a number of peaceful places to sit and become part of the river life. If you are lucky (and quiet!) 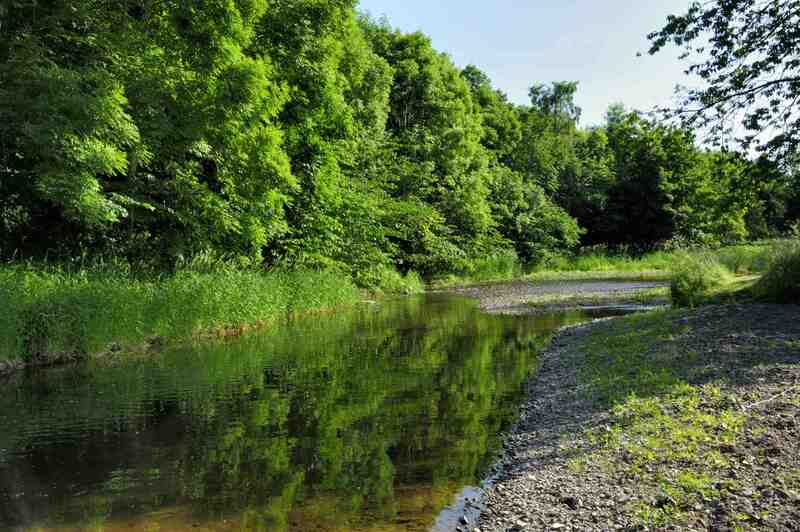 you may see Kingfishers, otters, dippers and a myriad of other river life. For the children, large and small, there are some amazing beaches and runnels to look for small beasties and fish. Where is Mindrum garden ? We are in North Northumberland (North East England), on the border with Scotland. About 3 miles south of Cornhill on Tweed. Could you tell me the garden opening days & times please? Apart from that, we open by appointment for groups. If you would like to drop in on your own or with a smaller group – Let me know when you are keen to come, and if there is a gap, we should be able to arrange something. Hello. I was told the garden was open every Wednesday during the summer months. Is this no longer the case? Last year we were open on Wednesday afternoons in June and July. This year, we are open by appointment during the summer months. We do have a lot of groups coming around so if you would like to come round, let me know and if there is a gap it should be fine.